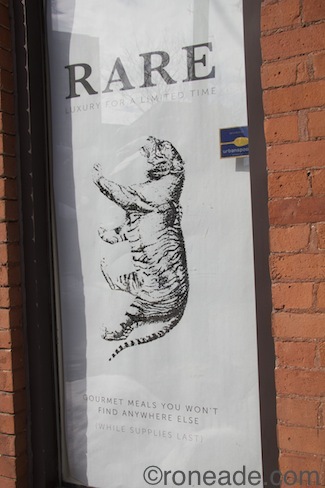 MAR 11 15 — The joke in Centretown these days involves a fake menu in the window at 327 Somerset St. W. that hides the latest restaurant renovation inside, in a space where others over time have come, set up tables and lost their shirts. Printed posters, which anyone can buy for $20 at a big-box stationery store, taped against glass have already set some tongues wagging on the free-rein Internet. Lions and tigers and turtles, oh my! But surely, I figure, no one with the ability to dress himself would fall for it — if only because, say, whales are mammals, after all, which would make caviar a pretty neat trick. And who in the Western Hemisphere knowingly eats cats, albeit big sinuous ones? 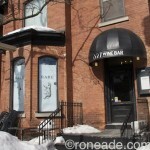 McVeigh, municipal candidate in the most recent city election, current president of the Centretown Citizens Community Association, and former general manager of five years at Absinthe Café on Wellington Street (before leaving in November), plans to open his restaurant between Bank and Metcalfe streets before the calendar turns to April. The official start date is March 27, if indeed the fickle Gods of Renovation are smiling. His 38-seat resto (plus room for 17 on the patio, if the snow ever melts) will be named Share Freehouse – not Rare — serving varied sharing plates under the watchful eye of chef Danny Mongeon, the talent in the kitchen. 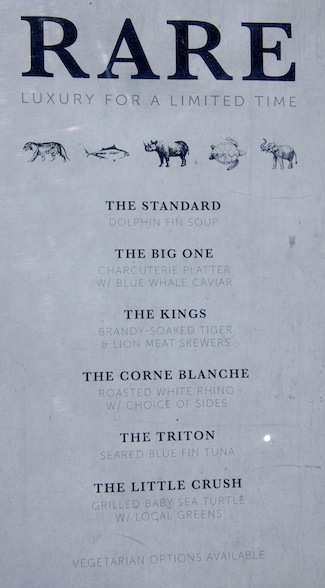 Both chef and restaurateur assure me there will be not a single bug, pussycat, sea turtle or smear of whale caviar in sight. In fact, all that playful silliness in the window is intended to provoke, to a degree, by teasing salivating believers with menu items that are anything but what Share Freehouse is about. The restaurant is located on the ground floor in one of those modest red-brick, two-storey homes that dot the Centretown landscape. Close inspection of a black awning above the doorway betrays a series of earlier eatery attempts where optimistic owners simply painted over the previous name to proclaim something new: The first sign announced Metro restaurant, then Bentiz Bistro painted it over in 2007 before suddenly — phft! 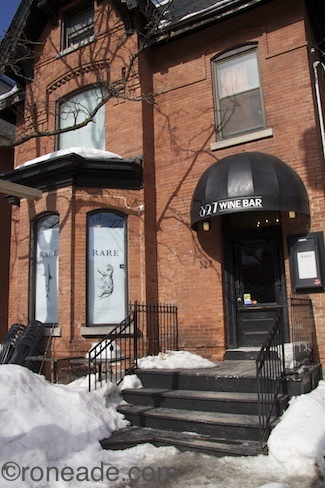 — vanishing in 2011, then it was 327 Wine Wine Bar that opened in summer 2012 and closed maybe three months ago. Now it’s going to be Share Freehouse. “That’s how people usually eat at home – sharing and talking about the food, the textures, the flavours and how the pesto works with pasta,” he says. Share Freehouse will feature Beau’s Lug Tread and, likely, Beyond the Pale The Darkness beers – always local, always microbrews on tap. 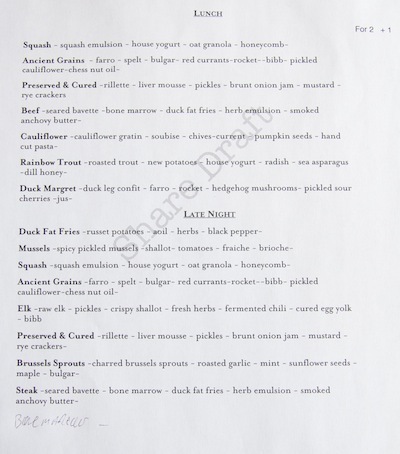 The wine list offers 24 red and whites from around the world. Signature cocktails will be made using in-house flavourings like ginger beer, syrups and sodas. “I like surrounding myself with crazy people like Danny who will take risks, while I try to keep things sane,” McVeigh laughs, again. 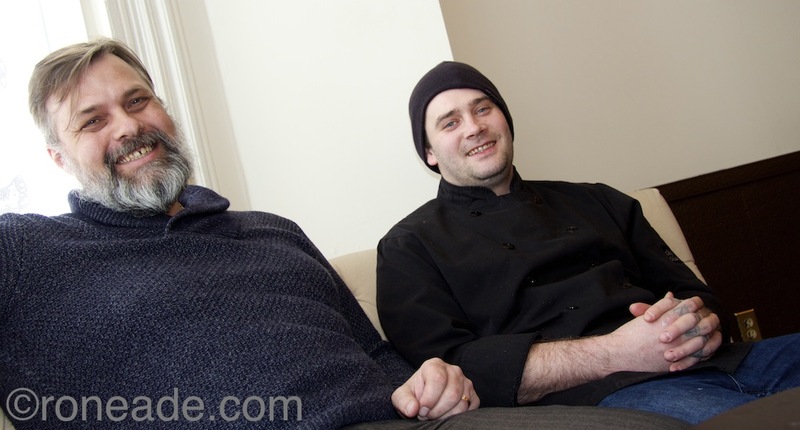 Food disciples will recall Mongeon as the energetic chef with a head full of ideas who in 2013 opened the kitchen at 40-seat Hooch Bourbon House, an eclectic eatery known for its horse tartare and stuffed pig trotters, likely the most odd items, on a leg of Rideau Street perhaps better known for panhandlers, tattoo parlours and payday loan windows. Last year, Mongeon launched a collective with eight young chefs under the name Flux to raise money for charity by visiting off-site locations – farms, vineyards and the like — serving memorable meals. In all, he hosted four dinners through the summer, and plans to resume this year with a different slate of eager chefs. But, first, he has to get the kitchen running at Share Freehouse, which over the past few weeks has involved a lot of elbow grease and tweaking. “I heard in late January that Thom was looking for a chef,” Mongeon says, “so we met over a bowl of Pho in Chinatown and hit it off right away. “I really like the concept and the opportunity to be creative. I like the idea of sharing plates – but not exactly family style where you pass a big bowl of mashed potatoes or ham or carrots. “I’m particularly excited to serve ingredients that chefs don’t use too often like birch syrup – similar to maple syrup, but made with birch sap – and foraged items like wild mushrooms, edible tree bark, tender shoots and blossoms,” Mongeon says. “Many people think I’ll be doing crazy meats, but with Thom being vegetarian I expect a lot of vegetarian choice on the menu using ancient grains, buckwheat, steel-cut oats. And we have so many local farms around, so we’ll definitely take advantage of what they offer. Mongeon expects customers looking for two appetizers with a glass of wine can expect to pay in the order of $40 plus tax, tip. Everything from bread to ketchup will be made from scratch. 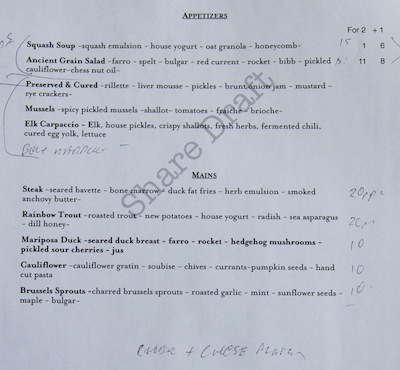 But, I ask, isn’t McVeigh a tiny bit nervous about opening another restaurant given the vagaries of today’s economy? “The places that do well and are well run will always survive,” McVeigh says matter-of-factly. And, not a single fish fin or whale’s egg in sight.